When a crack affects the performance of the structure, then we will repair it to restore its structural properties. Epoxy injection is typically the basis for this type of repair, with or without added reinforcement. The injected epoxy (like those made by Rhino Carbon Fiber) is actually stronger than the concrete and can restore the concrete strength, but if there is an underlying problem, such as an overloaded structure or some movement condition, the concrete will simply crack again in another location. To use epoxy injection to repair a crack, the crack is first cleaned by vacuuming or flushing with water to get out any dirt or contamination. The cracks on the surface are then sealed with an epoxy gel to prevent the injected epoxy from running out. Injection and venting ports are installed and the epoxy is injected. High pressure is not used since that could actually widen the cracks. Once the cracks have been filled, the ports and surface seals are removed, typically by grinding the surfaces flush with the concrete matrix. 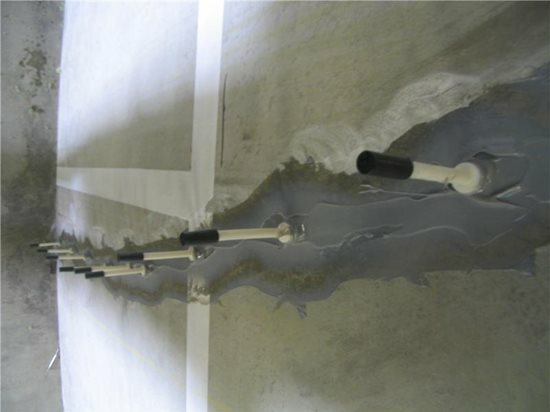 Epoxy injection has also been successfully used to repair surface delamination of slabs. Learn more about crack injection. When concrete is too deteriorated for epoxy injection, then all unsound concrete is removed and new concrete is placed. Obviously, great care must be taken to stabilize the structure prior to removing the damaged concrete, by shoring or other means. Once again, the secret to successful repairs of this sort is in the preparation. No deteriorated concrete can remain and anyplace where reinforcing is corroded, the concrete must be removed from completely around the bars, providing and at least ¾-inch clearance on all sides. The steel is then cleaned to remove any loose corrosion products (rust). If the cross section of the steel has been reduced significantly, new steel will be tied to the existing steel prior to replacing the concrete. As with most repaired areas, the edges of the repaired areas should be cut at a 90-degree angle. Feather edges should be avoided at all costs. The configuration of the area to be repaired should be kept as simple as possible, and preferably square. 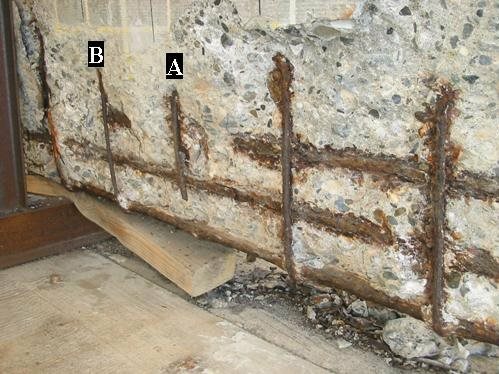 An excellent and fairly simple source of more information on this technique is ICRI's Guide for Surface Preparation for the Repair of Deteriorated Concrete Resulting from Reinforcing Steel Corrosion, Guideline No. 03730. If strengthening is needed, there are a variety of techniques used, including simply increasing the size of the concrete member and external reinforcing. 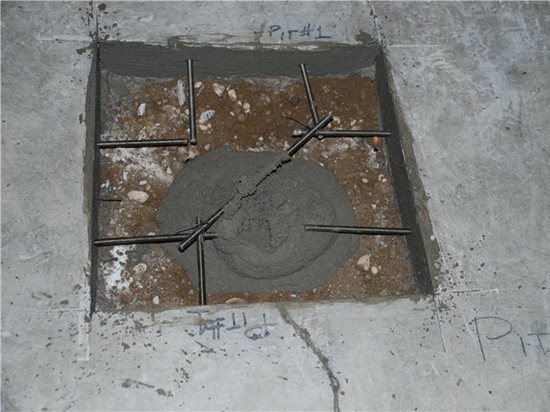 External reinforcing is often accomplished by bonding some sort of flexible reinforcement, like carbon or glass fibers, to the exterior of the concrete member then covering it with placed concrete, troweled-on concrete, or shotcrete.